If you have enjoyed this site then please send me a message. All feedback gratefully received. I will happily buy, sell or value old football games. Hi, I have a copy of the Super League Football Manager board game, Leeds Utd edition. All cards, board, and pieces are in immaculate condition. I have heard it is very rare and wondered if it has any value at all. You did not provide any contact details! I'd love to see a picture to help value it. It does sound very rare. Thanx for a most enjoyable site. 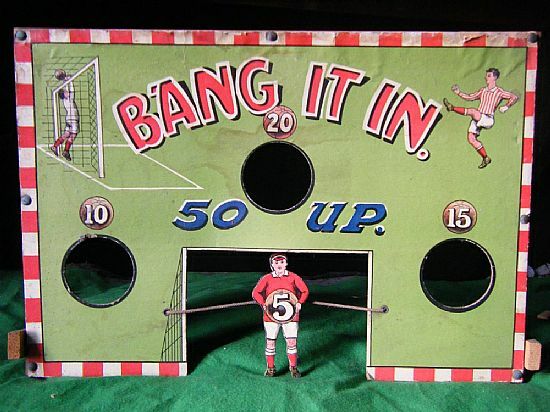 Loved Shoot, Penalty, and subbuteo as a kid. My Penalty ! pitch was in tatters and using msword I have created a pretty good A3 replica in .pdf format. This can be printed out on a good colour printer and even laminated ! Happy to share with anyone who needs a new pitch. Also have some magnetic footballers that I can't see on the site. Is there a way I can send photos ? I am seeking a game I played in the 80's.It was a stat based game only available by post advertised in World Soccer. You bought particular seasons and used dice as far as I recall and you could subscribe to obtain latest seasons updates. It was very detailed stat wise. F1 and other sports versions were also available. Any idea what it was called? Love to get hold of a set again.Anyone? I've bought a good set this of Penalty off eBay but to relive my youth, 50 years ago. Unfortunately there are only 51 cards. Is there ant way i can find out which is missing? I have the Penalty card, 5 Goalkeeper cards, 4 Corner cards, 4 Free Kicks, 17 'Hand' cards, 10 'spot' cards and 10 'square' cards. You are missing one of the 'hand' symbol cards. Here is the list of all 18 card moves. There have been some 112 posts and replies on this page. To view older ones search here. This only searches posts, not replies.